ALPHARETTA, Ga., July 25, 2013 – Sintea Plustek S.r.l., based in Milan, Italy, a leading supplier of minimally invasive spinal implants and delivery systems, has launched the new DOMINO cervical fusion cage implant made of Zeniva® polyetheretherketone (PEEK) resin from Solvay Specialty Polymers. The fusion cage implant – available in Italy and throughout Europe – has earned the CE (Conformité Européenne) mark which demonstrates compliance with numerous EC directives, enabling the product to be sold throughout the European region. Sintea Plustek selected Zeniva® PEEK – part of Solvay’s line of Solviva® Biomaterials – because of its modulus of elasticity which is very close to that of bone, thus allowing better load transfer. The thermoplastic biomaterial also has radiolucent properties which permit x-ray procedures and meets the requirements of ASTM F2026-12 for surgical implant applications, according to Laura Dell’Orto, technical marketing manager for Sintea Plustek. The DOMINO cervical plate-cage system allows cervical interbody fusion and disc height restoration by an anterior fixation. The implant system consists of an intersomatic cage made of 16-mm diam. machined Zeniva® PEEK rod which is integrated with an anterior fixation plate made of titanium alloy. The implant is available in three sizes, which allows for perfect adaptation to the patient’s anatomy. The cage has a convex shape on its superior face to fit perfectly in the intervertebral space and it is centrally opened to allow bone graft insertion which promotes fusion. The primary stability of the system, guaranteed by the anterior plate, is enhanced by the presence of notches on the superior and inferior surfaces. Zeniva® PEEK offers numerous advantages over metals such as titanium for spinal implants. The material offers many important benefits including biocompatibility, chemical inertness, and a modulus of elasticity that is close to that of bone. Based on biocompatibility testing, Zeniva® PEEK demonstrates no evidence of cytotoxicity, sensitization, irritation, or acute systemic toxicity. It also boasts high strength and stiffness. Sintea Plustek uses Zeniva® PEEK rod stock and performs high-precision machining to produce a full range of sizes. The manufacturing site for Zeniva® PEEK and other Solviva® Biomaterials in Alpharetta, Ga., is ISO 13485 registered and the relevant aspects of current Good Manufacturing Practices are also applied. Solvay’s biomaterial manufacturing processes are carefully validated and enhanced controls provide product traceability. In addition, all materials are tested in an ISO 17025 accredited lab. 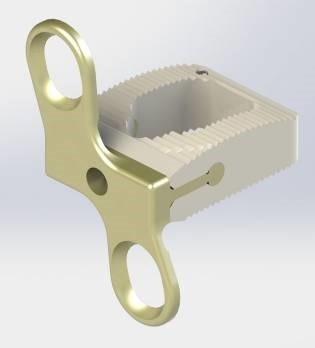 Sintea Plustek plans to sell the cervical fusion cage system globally and has already submitted technical documentation to regulatory bodies in various countries outside of Europe. In addition to Zeniva® PEEK, Solvay’s Solviva® Biomaterials line includes Proniva® self-reinforced polyphenylene (SRP), one of the world’s stiffest and strongest unreinforced thermoplastics which offers exceptional biocompatibility and hardness; Veriva® polyphenylsulfone (PPSU), which provides unsurpassed toughness combined with transparency and excellent biocompatibility; and Eviva® polysulfone (PSU), which offers practical toughness in a strong, transparent polymer.